Pottstown Area Rapid Transit, Inc. (PART) is a publicly owned, privately operated bus system operating in the Borough of Pottstown and surrounding communities. 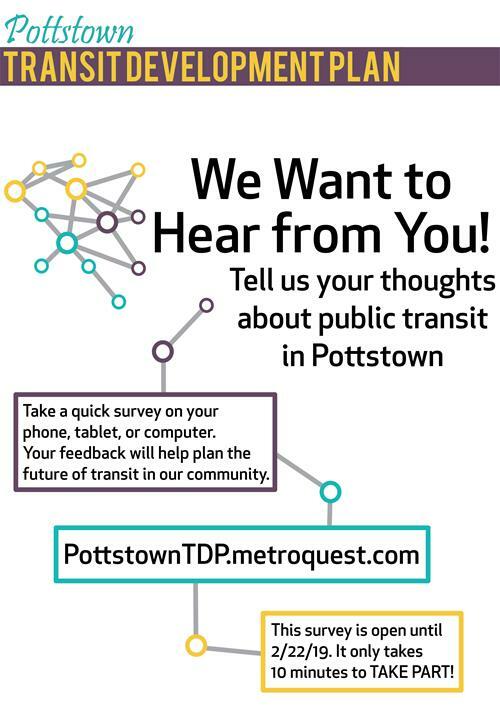 The Borough of Pottstown owns, funds, and administers the system while the day to day operations are the responsibility of PART, Inc.
Help us improve our service by completing the PART Customer Satisfaction Survey! 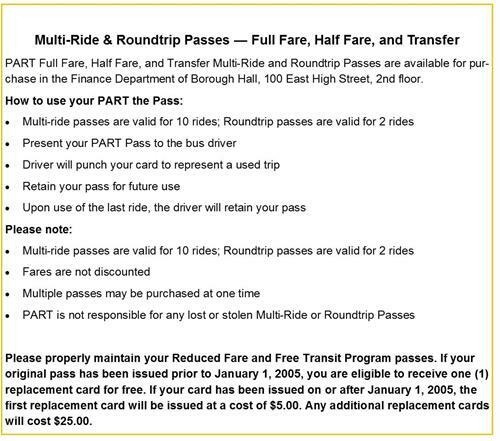 Multi-Ride Passes are available for purchase at the Finance Window at Borough Hall, 100 E. High Street, 2nd Floor. 610-326-5413 or visit the Pottstown Area Rapid Transit website. For information regarding PART’s Free Transit and Half Fare Program please contact the Borough Manager’s Office at 610-970-6512 or by email. Pottstown Area Rapid Transit operates in compliance with Federal Transit Administration, (FTA) program requirements and ensures that transit services are made available and equitably distributed, and provides equal access and mobility to any person without regard to race, color, or national origin, disability, gender, or age. Title VI of the Civil Rights Act of 1964; FTA Circular 4702.1A, “Title VI and Title VI Dependent Guidelines for Federal Transit Administration Recipients.” View PART's Title VI policy; for additional information, contact PART via email or telephone at (610) 970-6512. To file a complaint, please complete the Complaint Form. The Borough of Pottstown/Pottstown Area Rapid Transit has established a Disadvantaged Business Enterprise (DBE) program in accordance with regulations of the U.S. Department of Transportation (DOT), 49 CFR Part 26. View PART's DBE Policy. For additional information, contact PART via email or telphone at (610) 970-6512. If you have any questions, compliments, or concerns, please contact the Grants Administrator at 610-970-6512 or the Pottstown Area Rapid Transit Office at 610-326-5413. Additionally, you can email PART. All inquiries will be promptly investigated. The Southeastern Pennsylvania Transportation Authority, (SEPTA) provides commuter bus service to and from Pottstown to Norristown on Route 93. The route can connect travelers to other parts of Montgomery County and region. For more information please contact SEPTA at 610-279-8400.